Strongheart may have been a movie star, but he wasn't always famous. He started out as a police dog who could sniff out criminals and march like a soldier, but he didn't know how to have fun. 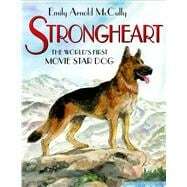 Larry Trimble was a Hollywood director who wanted to put Strongheart in his movies—not just as a pet but as the lead actor. Larry taught him to play with toys and walk like a regular dog. In his films, Strongheart brought audiences to tears. He was a sensation! But when Strongheart's military training led to trouble, was his career over? Set in the early days of silent movies, Emily Arnold McCully's extraordinary story about a real-life hero will capture the hearts of dog lovers and movie fans everywhere. Emily Arnold McCully is a Caldecott medalist known for bringing history to life. She is the author/illustrator of the critically acclaimed Wonder Horse: The True Story of the World’s Smartest Horse, as well as The Secret Cave: Discovering Lascaux, Manjiro: The Boy Who Risked His Life for Two Countries, and the Caldecott Medal–winner Mirette on the High Wire. She divides her time between New York City and Chatham, New York.